New graduate students in the OEB department are required to take a year-long “Welcome to Grad School” seminar. It met once a week and the agenda each night flip-flopped between professional development topics (e.g. how to make a resume, what is active learning) and Q&A sessions with two OEB professors. The meet and greets with the professors were definitely the best nights of the seminar, in my opinion. Some professor pairs were best buds and just one-upped each other with crazy story after crazy story all night. Some pairs had very different views and approaches to life and academia and their answers to our questions were hilariously night and day. We started each Q&A session with the same three questions: what would you be doing if you weren’t a research scientist/professor, was there a time you failed during grad school, and what piece of advice would you give to first year graduate students? The first question often sparked interesting discussions about parallels between science and other professions, like being murder detectives…or any job where you solved mysteries or problems, really. Science policy came up once or twice. One or two professors had been involved with consulting or even running their own companies, and jumping to those jobs full-time seemed logical. The failure question was generally enlightening, but not always in the way I expected. For example, one professor replied, “Oh, I never failed at what I was doing, but I can talk about a time one of my own graduate students failed….” Yeah. To be fair, he was offered a professorship at Harvard before he hit 30, and that statement of having never made a mistake could simply be the truth, but oh man did it come off as self-aggrandizing. Answers to this question were good personality indicators, I feel. But the answers to the last question have probably had the biggest impact on my own experiences so far. What advice would you give a G1? I didn’t think to write down all the answers as we went through the year, but I do remember the pieces of advice that resonated with me. Write as much as you can as often as you can. Take the first two years to explore your field and neighboring fields. Go to a variety of seminars, introduce yourself to speakers, read a lot of journals and papers, especially ones not in your field. Learn what the labs around you do. During the first two years of graduate school, you have freedom of time that you won’t see for at least another 15 years. Use it to broaden your horizons before the time comes when you really have to narrow your focus. Grad school is jumping from failure to failure with no loss of zeal. If you have an opportunity to receive professional development training in graduate school, take it. The sooner the better. It’s like a sub clause of Murphy’s Law: You can just about always count on receiving the training after you needed it. It’s better to get the training two or three years before you need it than to wait and get it too late to help. When taking advice from people, remember to take it with a grain of salt. Everybody’s path is different, and what worked for others might not work for you. While all these pieces of advice have played roles in my life, to varying degrees, I want to follow-up with the two that have had the biggest impact so far. David Haig’s advice came about a month or so after I started this blog, and it felt like an affirmation of my decision to use this blog to work on my communication skills (along with my other reasons). It also played a part in my decision to begin writing for the short-form blog division of Science in the News (SITN), an outreach program based out of the med school. These short-form blogs are roughly 250 words in length, covering some interesting news making waves in the science or public community. Thus, we call these short-form blogs “Waves.” We have a team of about 10-15 writers, and each member writes about a wave a month or so. You can find a list of my waves here. I have written for SITN for two years now, participating simply as a writer for the first year. Last year, I agreed to help edit my peers’ waves as an “Assistant Editor” type of role, as well as continuing to write my own waves. This coming year, however, the current editor-in-chief is stepping down to focus on finishing her thesis and she asked me if I would be willing to take over, as I was the logical person to hand the reins off to. So, this fall, I will be the new editor-in-chief for the short-form blog division at SITN! This probably means that I won’t write my own waves anymore, but I look forward to the new experience of trying to manage a team of people. And so, David’s advice has definitely helped shape the path of my grad school experiences. In the long run, hopefully all this writing experience will show when I begin writing things of slightly more importance than blogs. The second piece of advice that I have consciously followed is Elena Kramer’s. “Get the training you need before you need it.” I grew up with a similar adage: better to have something and not need it, than need it and not have it. I think of it this way: graduate school is supposed to train me to be more than just an adequate researcher. Ideally, when I graduate, I should have some training in all aspects of academia, from mentoring undergraduates to applying for grants. Some of this stuff I should naturally pick up from working in the lab with George. However, I feel it’s silly to think that I am going to receive absolutely everything I need from him, and in a time frame that is useful for me. So, with George’s blessing, I try to take a few short workshops a year, in addition to whatever classes I’m taking or auditing. A good example was with my qualification exams. As part of the exams, I had to make three course syllabi. They didn’t need to be official syllabi or anything, and most students leave them as a list of topics and barely anything else. However, I was aware that I would need to know how to make a syllabus from the get-go. In the spring of my first year, I attended a workshop hosted through the Bok Center for Teaching and Learning, “Designing a Syllabus.” We covered things like aesthetic design, content, organization, and the concept of backward design – nearly all of which I used when I set out to make my quals syllabi a year later. My plan worked perfectly. As a TF for the fish course, I ended up writing a good chunk of the questions on the exams. Part of it was that I was always the first person to start working on the exams, and by the time the other TFs joined, I had already compiled a huge list of questions from the reading and lectures. Proportionately speaking, even though I was 1/4th of the exam writing team, I wrote more than half of the questions used in the exams. I’m not complaining, not at all. Having never written any type of exam question before, I knew that the more questions I wrote, the better my questions would become. I was glad to get the experience, even if I had no idea what I was doing. Having taken the Problems and P-Sets workshop, I know now that most of my questions were “factual” questions, quizzing students on whether they had memorized some tid-bit of knowledge. I tried to write questions that required students use a deeper understanding of the topics. That wasn’t always easy, given that half the lecture material boiled down to “memorize the phylogeny and some defining characteristics about these important fish families.” So, the majority of the questions I could write about that material were the boring “factual” questions. For topics dealing with biological systems, ecology, etc, I could write higher-level bloom questions, but that doesn’t mean they were very good (you know, as I was newbie question writer). 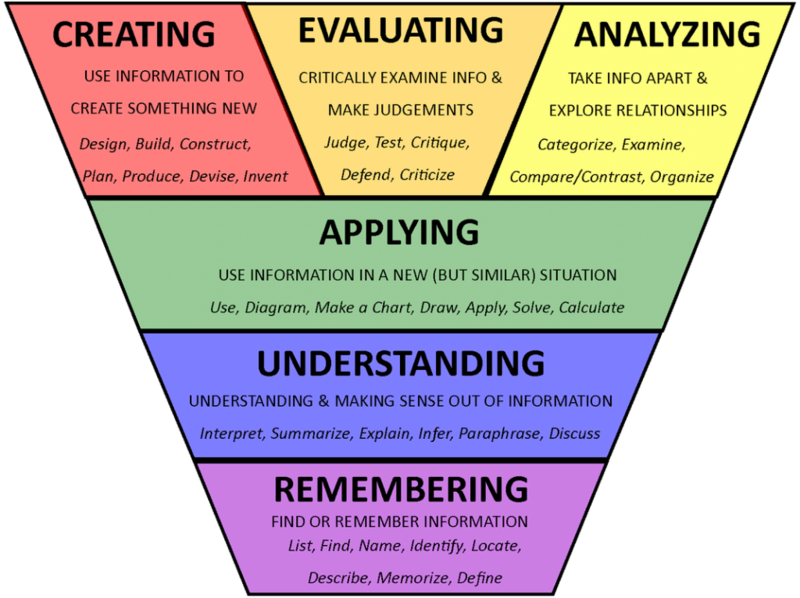 Bloom’s Taxonomy, a hierarchy of question types. At the base, you have factual questions, which start with words like Describe, Memorize, and Define. Then you have understanding type questions–explain this idea. Then application questions: given what you know about X, tell me something about Y. And then at the top of the hierarchy, you get into the high-level questions. A good exam or p-set should have a healthy mix of Remembering, Understanding, Applying, and a few of the top-tier, if appropriate. Like a bell-curve distribution centered between Remembering and Understanding. When grading, I calculated the average grade, the percent of students who had 100% of the points available for the questions, and the percent of students who had 0% for questions. I could retroactively determine if kids did well on the questions I wrote, and that gave me some feedback about how I was doing. I enjoyed doing this type of analysis (IRT analysis, I believe), but it would have been nice to have some sort of intuition about question-writing beforehand. This experience reinforced the idea that I should try to get the training I need before I need it. So far, I believe this has been the only situation where I knew I needed training and was unable to get it in time. Hopefully it stays this way! Before I led lab-sections for the fish course, I took a one-day workshop in how to lead a lab section. Before I start mentoring undergrads in research projects, I participated in a workshop outlining the responsibilities of a grad mentor, the resources available to us and undergrad researchers, best tips and practices, and so on. Even though I have no experience mentoring undergrads at the moment, I hope I know what to expect from the students, what is expected from me, and people I can turn to for help or guidance. Before I started writing my paper, I took a workshop about best practices in making graphics, figures, and charts. This August, I’m teaching a course in the fall that will have in-class labs and a separate TF-led discussion section. Now, I’ve never led a discussion section before, and I’m mildly concerned that I have no idea what I’m doing….again. So, I’ve signed up for a short workshop about how to lead a discussion group. To conclude, in grad school I’ve become more cognizant of what skills I lack and I’m trying to specifically target those areas through workshops and seminars, thanks to Elena’s advice. Murphy’s Law has screwed with my life too many times for my liking (i.e., nearly every day), and trying to minimize the situations where it could have a foothold seems like a solid plan to me! But after everything is said and done, let’s not forget Mansi’s words of wisdom: just because something works for me, doesn’t mean it’ll work for you. When you need advice about a certain topic, ask as many people as you reasonably can. You’re taking a survey of all the possible options people have followed, all the different methods and approaches to a situation. From that survey, you can probably find one or two pieces of advice that will work better than the rest. But if you only ask one or two people to begin with, then you’ll never know if there’s something else you could be doing that would be better for you. What pieces of advice have been most impactful in your grad school career? Was there any anti-advice that you wish you’d never heard of or followed? P.S. – The third most influential advice I’ve heard is, “The best way to find errors in your writing is to press send/submit.” And it works like a charm, unfortunately. Previous Post: We’re learning how to use PIV!! What do research and trees have in common?